Hi friends! I hope you're having a great day! We are doing ok. We are wrapping up our summer which is bittersweet. Avery is growing up super fast and she's getting more teeth. The boys are doing pretty well. Today, I'm showing some fun cards I've made for my Project Life album using stamps from Stampcow. These are really cute stamps that are perfect for scrapbooking. They are super cute and fit well with my style. I have been really into Project Life lately so of course, I wanted to make some journaling cards. 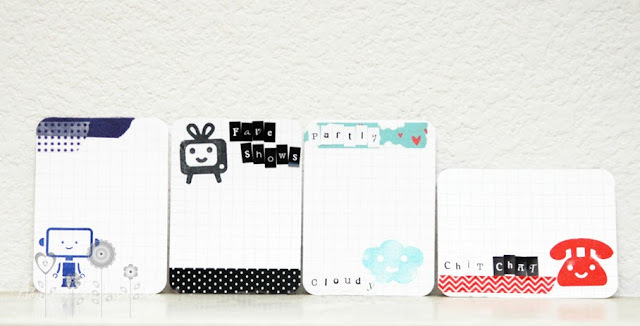 I used washi tape and small alphabet stickers to make these cards. The base are the Becky Higgins grid cards. So cute! I love the TV stamp most!